Yesterday, the Verizon IndyCar Series tested its new universal aero kit for the first time on an oval in 2018. The four-hour test session at ISM Raceway in Avondale, Arizona was set for rookie orientation, though some veterans made cameo appearances to shake down team cars and test new technology. Leading the new crop of drivers was Matheus Leist, who topped the charts with a best lap of 184.236 MPH in his A.J. Foyt Racing Chevrolet. Pacing the field for the Honda camp was Dale Coyne Racing’s Pietro Fittipaldi. Fittipaldi, the 2017 Formula Renault champion, ended the day with a best lap of 183.347 MPH. Schmidt Peterson Motorsports was third on the time sheets, but the lap speed of 181.976 MPH was not with former DTM driver Robert Wickens, but rather his teammate James Hinchcliffe. Wickens’ best speed of the day was a lap at 180.158 MPH. Ed Carpenter Racing’s Spencer Pigot clocked in at 180.589 MPH and Andretti Autosport’s Zach Veach rounded out the top five with a speed of 179.592 miles per hour. Pigot and Veach both competed part-time in the Verizon IndyCar Series last year, though each are set to embark on their first full-time season in IndyCar. The “deflector” device installed on Scott Dixon’s No. 9 Chip Ganassi Racing machine. Kyle Kaiser, the 2017 Indy Lights champion, ended up sixth at 179.043 MPH for Juncos Racing, while Marco Andretti finished seventh with a best lap of 178.708 MPH. The time was posted while conducting a shakedown run for Veach. 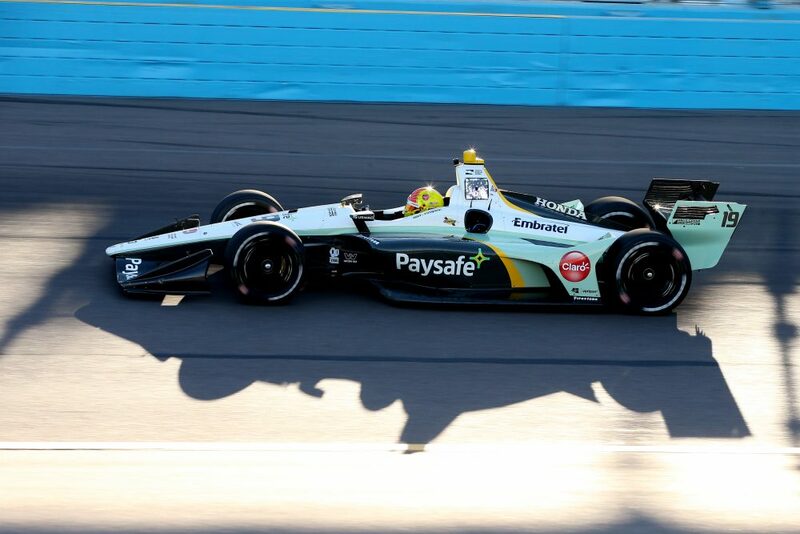 Gabby Chaves, who returns to a full-time effort after running three races with newcomers Harding Racing last season, ended the session eighth at 174.314 miles per hour. Also of note, today was the first time that the series conducted on-track testing for what is being referred to as a “deflector,” a new screen mounted to the front of the cockpit designed to keep debris from hitting a driver in the event of a crash. 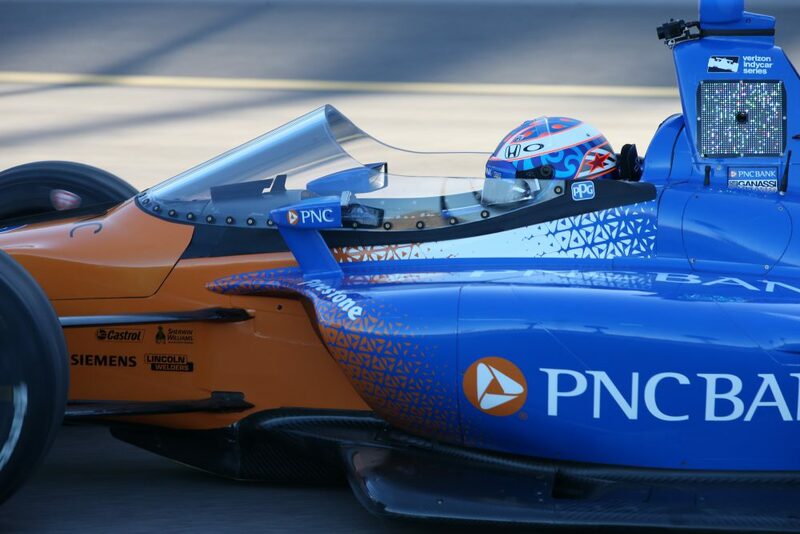 Four-time series champion Scott Dixon tested the new deflector in his Chip Ganassi Racing Honda, decked out in a fresh PNC Bank livery. Dixon conducted three separate test sessions, once during the afternoon, once during sunset and one during nightfall. Dixon was impressed by the absence of a distorted cockpit view, the main concern from many around the series. The 2008 Indianapolis 500 winner also explained that the car was noticeably quieter, but also much warmer. The newly-dubbed “deflector” is not expected to be mandated until 2019, but early reviews are positive as the series looks for the latest innovation to increase safety. Stay tuned to Open-Wheels this weekend for continued coverage of the 2018 Prix View INDYCAR test at ISM Raceway, as Spencer Neff gives on-site analysis and content. As the excitement builds for the new season, drivers, teams and the series are all chomping at the bit to turn some meaningful laps in the universal aero kit. With that excitement comes a flurry of social media posts giving a little behind-the-scenes look at some of the proceedings. After each day of testing this weekend in Arizona, we will compile some of the best and most interesting social media posts from the day’s activities. Here is the social media round-up from Thursday, February 8 at ISM Raceway. Here are the final results for the #INDYCAR rookie orientation testing session this afternoon @ISMRaceway :@MatheusLeist of @AJFoytRacing led the way with a best lap of 19.970 seconds (184.236 MPH), while @PiFitti followed closely behind.